Pantasia Affiliates which is owned by Silverstone Overseas Limited, is the affiliate program for Pantasia casinos. Offering one of the most generous and profitable casino affiliate programs in the industry, its partner online casinos are powered by Rival Gaming, a highly respected software platform developer in the casino industry. They have a unique profile and wide raft of game offerings, which includes the extraordinary i-Slot titles from Rival Gaming. Their new slot machines are quite interactive and are bound to add to the enticing regular multi-reel multi-line slot game titles that pack incredible story lines. The Pantasia casino is one of the casinos that Rival Gaming launched early, and they are based in the jurisdiction of Netherlands Antilles. Headquartered and licensed with the laws of the government of Curaçao. This affiliate program seeks to make earning casino commissions quite easy and simple for her affiliates. Pantasia Affiliates allows promotion of their popular casinos, Pantasia and Mayan Fortune. These casinos have Terms Certifications completed and are therefore AGD-Certified. The casinos are available in multiple languages and are accessible to most players worldwide. If you’re looking for a casino affiliate program that comes with a no deposit bonus for their casino players, then Pantasia will do the job for you. The Pantasia Affiliates program provides its partners with a flat commission plan that stands at 35% of revenue share. The revenue share plan is the default structure that all new affiliates sign up to, with all commissions being calculated on the basis of the net revenue. The return percentage of the revenue share that is owed an affiliate naturally increases as the revenue accrued out of references goes up the payment structure. As with every other program, affiliates typically earn commission when they host ads on their own portals which in turn generate traffic for Pantasia’s casino brands. The traffic that has been converted to paying sign-ups counts as a source of potential revenue, and the partner’s profits are plowed to the affiliate. There are no negative carryovers with Pantasia Affiliates, which means when the balance is in the negative, affiliates start at zero on the first day of the following month. Additionally, there is no bundling either. Payout Methods: Player Account, Neteller, Skrill, ACH and Bank Wire Transfer. 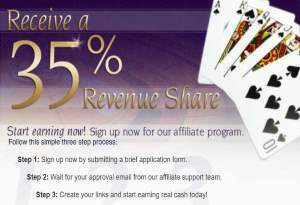 The affiliate program lets partners make money when they drive players to online casinos. Affiliates also earn commissions when they refer new affiliates to the program. Therefore, interested affiliates looking to promote to other prospective marketers are sure to boost their earnings with the sub-affiliate program from Pantasia Affiliates. This one tier sub-affiliate referral attraction order pays a commission of 10% of the net revenue for all referrals. Pantasia Affiliates processes all their commission payments within the first 15 days of every end-month. There are no administrative costs on the commission payments, and affiliates can opt to receive their payments through a range of payment methods. These methods include the Player Account, Neteller, Skrill, ACH and Bank Wire Transfer. By default, all commissions are paid in USD, and the payments must meet a minimum balance of $50 and $100 for affiliates who reside outside North America. Balances may carry over from month-to-month and this means an affiliate will only receive the payment once it has passed the stated threshold. The affiliate structure does not offer a CPA program. The Pantasia Affiliates program employs the Rival Gaming software platform which provides the affiliates with marketing material, text links, banners plus other promotional materials so that they can promote the Pantasia Casinos. The program utilizes a user-friendly statistical tool on its landing page which records all player data in real-time and also tracks how every player comes in to their casino portals. This way, affiliates are able to analyze their work in order to be even more effective.